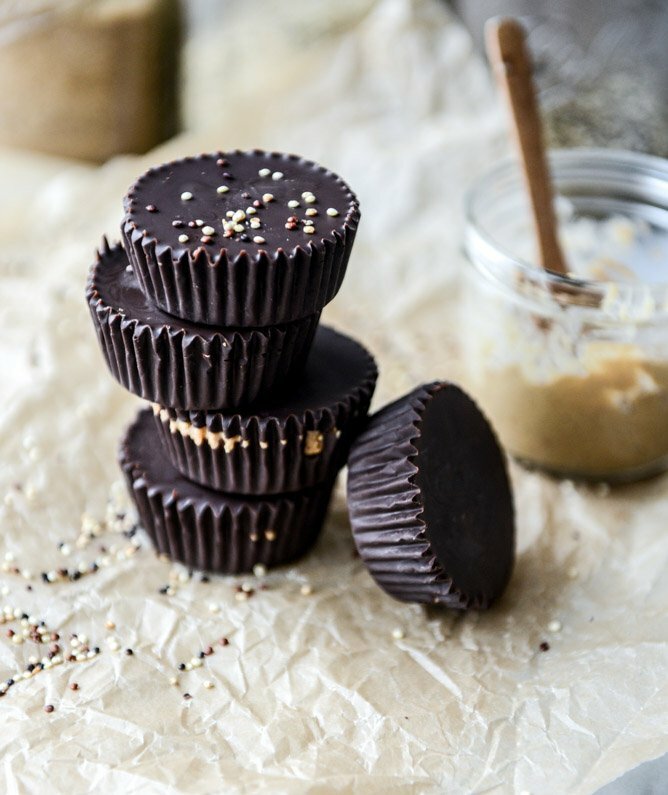 Toasted Quinoa Cashew Butter Cups. See also: how to eat an obnoxious amount of snacks. Because that is totally going to happen here. So here’s the Friday question. Please tell me that you’ve tried Trader Joe’s milk chocolate jumbles?! They happen to be an incredible little pecan turtle bite made with toasted quinoa and I was absolutely set on recreating them. SET. But. Then I got all worked up about having the caramel stay gooey and being able to cover both sides in chocolate, so I figured I’d make a copycat jumble cup. With the caramel. That sounded so much easier. THEN I spied the cashew butter in our pantry and since it’s a current favorite (so freaking good with apples! ), knew I had to use it. Plus, it’s slightly sweeter than almond butter, at least I think that it is. Which is perfect when dark chocolate is involved. Toasting the quinoa makes it so poppable and crunchy, almost like a homemade cereal or something. The texture is fabulous. So if you’re one of those people that just can’t deal with cooked quinoa dishes and think it’s a bowl of mush, here you go. The perfect way to get your quinoa fix. I mean, these cups include a complete protein. What more could you need? Now what are you doing this weekend? Besides making ten batches of grown up peanut butter cups. Melt the chocolate in the microwave (I do 30 seconds on 50% power a few times, stirring after each time, and stirring until melted) or a double boiler. Stir in the coconut oil. Line a muffin pan with liners. Place 1 to 2 tablespoons of melted chocolate into the liners and brush it up along the sides with a pastry brush. Let the chocolate set (or you can place it in the fridge or freezer to set quickly – I do this now, because you’ll end up doing it with the cashew butter filling later). To toast the quinoa, add it to a skillet over medium heat. Cook, stirring and tossing often, until the quinoa becomes fragrant and pops – and also turns golden if you’re using white quinoa – it will take about 5 to 6 minutes. Melt the cashew butter in the microwave or in a small saucepan. Stir in the toasted quinoa. Spoon 1 to 2 tablespoons of the cashew butter mixture in the chocolate liners. Place the pan back in the fridge to set for 30 minutes or so. Once set, Spoon the remaining chocolate over the cashew butter, finishing off the cups. Place the pan back in the fridge to set. Eat up!! Can we PUH-LEASE call this a health food. Thank you. Crunchy bits made of quinoa?! Aka guiltfree? Sounds perfect to me! Love this idea! Delicious and nutritious! How could we go wrong! The quinoa in this is a brilliant addition! These look awesome! I never would have thought to put quinoa into a dessert. I love this idea, since I’m in the camp of cooked quinoa is not great. I’ll have to try these stat! I am calling it healthy and letting my husband know there is quinoa in it so he won’t eat any. i mean….it IS considered healthy because of the quinoa right? At least that’s what I’m going to tell myself ;). Making these. I absolutely LOOVE toasted quinoa! I just love the crunch they make in my sweets! I am definitely going to try these, and I’m sure they will go sSUPER fast! And it gives me an excuse to get cashew butter cause that sounds totally yummmmss. I die x 1000!!! Three of my favorite things in bite-size!! I cant wait to try these! Oh my! This looks mouthwatering delicious! I love cashew butter! Omg. These are like Nestle crunch and pb(cashew) cups had a baby! What a cool way to incorporate quinoa! OMG. I am literally pulling out my insulin pen in anticipation of making these – holy yum!! Happy Friday chica! I am freaking out over these! I’m not a huge quinoa fan (regardless of the fact that I posted one of my favorite recipes to date this week using the stuff), but I’m SO into popping it! Must try this weekend. Woah, these chocolate cups look HEAVENLY! I love the addition of the toasted quinoa for added crunch! YUM! Do you do all of your own photography? It is truly beautiful. Goodness. All that dark chocolate and toasted quinoa, so good it’s almost evil. I’m drooling. I think we can ABSOLUTELY call this a health food. Love this idea! It will be the perfect “healthy” treat for us to keep around the house. I tossed mini peanut butter cups (actually super mini, they were chocolate chip sized peanut butter cups) in my bowl of hot brown butter popcorn a couple weeks ago and it was pretty much the best snack ever. 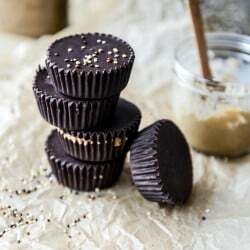 But then, I’ve never had these quinoa cashew butter cups so I kind of need to get on that ASAP! These look incredible! Definitely a health food !!!! I leave quinoa for lunch time meals, but I need to break it out for dessert! I have never had it toasted, but now I need to try it! I couldn’t wait any longer to make these so I made them for some company tonight. I used Lindt dark chocolate bars and some homemade cashew butter that I had leftover. It’s amazing how similar these look to Reese peanut butter cups just by using regular cupcake liners and sticking them in the freezer for a while. Super duper easy to make! I just found your blog and instagram, and I’m never leaving! Yesssss we can definitely call these health food! I love quinoa but would never have thought of doing this. Love it! And I’ve never tried cashew butter but I’m looking forward to it; it seems long overdue! I’ve never successfully popped quinoa but I’m motivated to try again by this recipe. I love almond butter so much, though, that I might swap that out. Where do I find cashew butter? Delicioso! They fit the Always Hungry eating plan, so its followers are sharing this a lot!